Ohkay so, directed by Haseeb Ali, written by Seema Munaf & produced by Momina Duraid; Mere Humdam commenced last night on Hum TV. The first episode not only introduced the characters decently but also established the plot of the drama that the story will revolve around. If we put it in simple words, Mere Humdam is a story based on a love triangle. We have the female lead Warda (Sarah Khan) who is an honest & clean-hearted person to an extent of being gullible but she is confident & responsible. 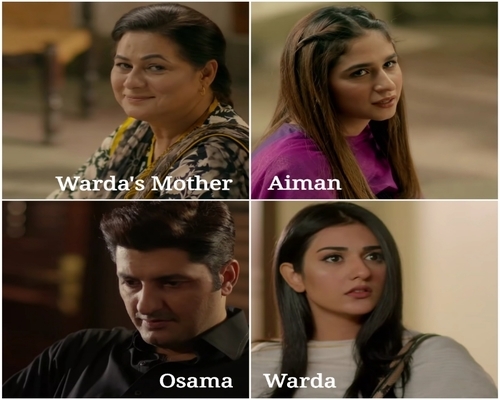 Warda is the eldest daughter & she has one younger sister Aiman (Natalia Awais). Aiman & their mother is all Warda has in her family. Warda has just started working & that is what is going to change the course of her life. Warda & Aiman share a very strong sisterly bond but there is a lot of bickering & banters involved too which made their relationship seems very real & natural. On the other hand we have Mr. Zaidi’s family which includes his mother, his wife (Fazila Qazi) & a son Haris (Gohar Mumtaz) who is well & truly spoiled by his grandmother & that is the reason he is so pampered that he doesn’t understand his basic responsibilities. Mr. Zaidi’s business is being taken care of by Osama (Syed Jibran) who is not only responsible & mature but is very compassionate & caring person as well. Osama happens to be a close friend of Haris too but Haris’s family treat him as an outsider & it is only his father who respects Osama a lot for what he does for him & how he takes care of his business as his own. Well, Warda & Osama meet on the first day of work when Warda goes for an interview. She forms an opinion about Osama without even knowing him but her impression about him changes the very next day when in the middle of office hours he drives her home so that she could see her mother, who falls sick. Warda then realizes that Osama is totally different than what she had thought of him & that gives her the courage to not only apologize to him but befriend him too. Even though at first Osama thinks Warda won’t be suitable for this job because she lacks experiences but Mr. Zaidi insists on appointing her because he tells Osama that he sees potential in her. Later when Mr. Zaidi is having a conversation with his family, he tells them that he has found a girl for Haris & she is the kind of girl that everyone will like, which actually was the real motive behind him hiring her. Warda & Osama develop understanding & grow comfortable with each other in a short span of time, so much so that they kind of start to like each other as well but Osama doesn’t really confess his feelings because it seems he was waiting for the right time which will definitely cost him a lot. Haris is the kind of person who is not in touch with his emotions, he is just someone who is so used to having things his way & has this sense of entitlement. 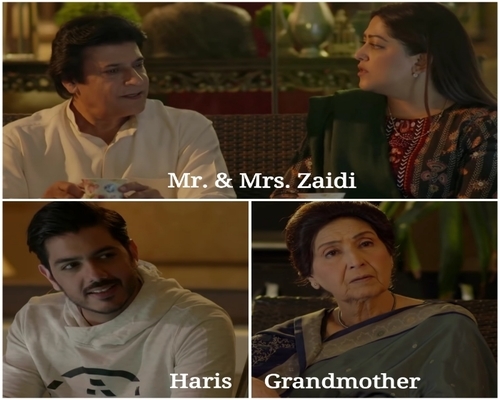 That is because Haris’s family especially his grandmother has pampered him so much that he gotten used to the idea of having everything served to him on a golden platter. He liked Warda too but he didn’t really show excitement about it. Osama accompanies Haris & that is when he finds out that it is Warda who has been chosen by his family for Haris. Overall, the first episode of Mere Humdam was decent. It didn’t offer anything new but since I am so over watching such twisted & negative dramas, these days I am in for simple stories which are executed nicely & I hope Mere Humdam turns out to be that kind of a drama. Plus I am also watching it for Sarah Khan & Syed Jibran. Their first interaction reminded me of a scene from the Bollywood movie Chal Mere Bhai where even the dialogues were the same. I loved Warda’s character & Sarah Khan looked absolutely beautiful throughout the episode. I feel Hum Tv these days has changed the criteria of the kind of dramas they want to show, like now it seems they are into simple love stories & are taking a break from the social issues which I am definitely happy about. Since ARY is bent on making dramas on social issues, it is good to see another leading channel taking a different route. The acting as well as the direction was decent & I am looking forward to the next episode. Please share your thoughts about the first episode of Mere Humdam.